Need a specialist drain cleaner? 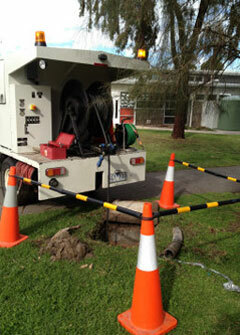 At DrainJet, we specialise in drain cleaning, drain camera work and non destructive digging or hydro excavation, with some of our vehicles also being equipped with 4WD. The goal of our business is to deal with our customers with honesty and respect and help them to gain the highest value for money for our services, whether a blocked drain, sewer or stormwater, electrical conduit cleaning, or even comms ducts cleaning and roping. We can also look after your regular drainage maintenance, including CCTV, root cutting and cleaning with drain sizes from 50 mm through to 2 meters. We also have an engineering section in our workshop that allows us to make custom equipment for specialist drain cleaning jobs, with no job being too difficult, please browse through our projects page for difficult and out of the box drain cleaning jobs we have completed. We provide specialist pipe cleaning, CCTV and non destructive digging for plumbers, maintenance companies, local councils, water authorities, and other drain cleaning contractors. For all other enquiries please call between the hours of 7:00 am and 5:00 pm. © Copyright 2017 Drainjet. All Rights Reserved.